Ustad Nusrat Fateh Ali Khan passed away on August 16, 1997. Thirteen years after his death, those who worked with Nusrat Fateh Ali Khan still feel his loss deeply. 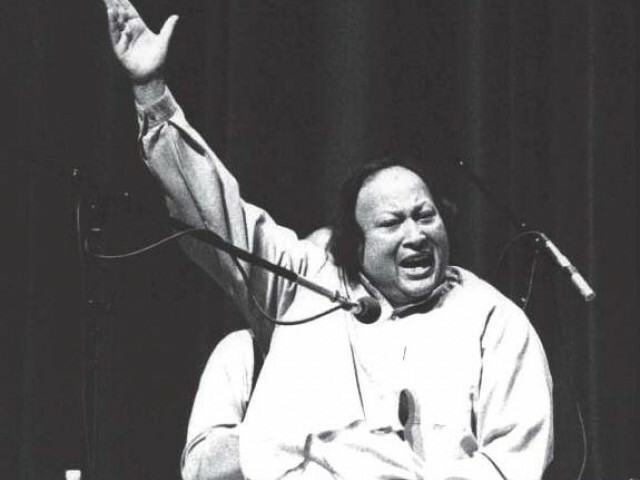 Nusrat Fateh Ali Khan was an icon, whose music resonates in qawwali evenings and in any discussion about the history of Pakistani music, and whose loss continues to be felt. His work continues to be featured in Western productions, such as the recently released film Eat Pray Love, whose soundtrack includes “The Long Road” by Khan. He passed away on August 16, 1997. Composer M Arshad, who worked with Khan for over a decade, says that the dedication Nusrat had to music is rarely found now. “Young singers are doing good work, but people like Khan sahib aren’t born every day,” he told The Express Tribune. “I remember he would not leave the harmonium the whole night and kept rehearsing. It wasn’t unusual for the recording of a qawwali to start on one night and end the next. I have not seen such passion in my life anywhere,” he said. Arshad recorded almost 500 songs with the late musician. According to Arshad, while young singers including Rahat Fateh Ali, Rizwan and Muazzam and Asif Santo are doing great work in the genre of qawwali music but the space created by Nusrat Fateh Ali Khan is hard to fill. According to Arshad, “Nowadays singers record one song, make a video and want to get sponsors. This is not the way it works. I remember Nusrat Fateh Ali Khan searching for new poetry and he kept practicing. It is very easy to say that Sufi music is great but most people don’t understand what Sufi means,” he said. “Khan sahib would keep reading the works of Waris Shah, Bulleh Shah and Baba Farid. He knew a large chunk of poetry by heart. One has to deeply understand the soul of what one is practicing and only then one can achieve stature in it,” he said. Nusrat Fateh Ali Khan was the light of his household, according to one of his sisters. According to Arshad, “He loved good food. His attitude with the people working with him was extraordinary. I have never met someone who complained about his attitude. He loved the people around him,” he said. Music teachers believe that Nusrat Fateh Ali Khan’s work needs to be preserved. Even though there are scores of CDs and cassettes available which contain his work, a full compilation would be a service to his memory. “His work should be preserved because he has done a great job. International fame came to him through Dead Man Walking, but here he is ghar ki murghai daal barabar,” Sampurna’s Saffiya Beg told The Express Tribune. Previous Should Islamic banking broaden its base?